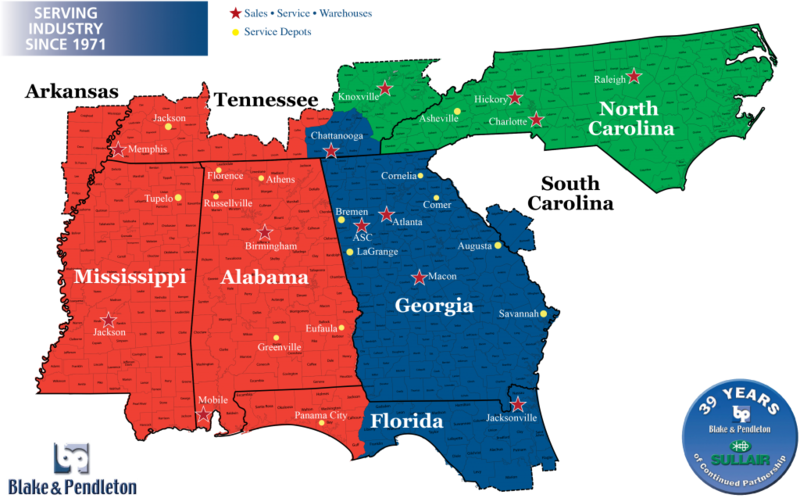 Our facilities in Alabama, Florida, Georgia, Mississippi, Tennessee and North Carolina are in prime locations for continued growth in the markets that we serve. We have over 100,000-sq.ft of office and warehouse space strategically located to serve the needs of our customers. Our Macon facility has over 55,000-sq.ft., which contains the corporate offices, central warehouse, compressor and pump assembly and repair shop. We also rebuild rotary screw compressor airends of all brands and have full machining capabilities. We have the capability to test compressor and pump packages up to 250HP.When a customer has an emergency requirement we have rental fleet of compressors from 10HP – 300HP and rental air dryers for 100SCFM to 5000SCFM. In addition to our 11 Sales, Service, and Maintenance Locations we have 12 Service Depots logistically placed for more localized service.